Astronomers constantly probe the skies for the unexpected. They search for unforeseen bumps in their data — signaling an unknown planet orbiting a star, a new class of astronomical objects or even a new set of physical laws that will rewrite the old ones. They are willing to embrace new ideas that may replace the wisdom of years past. But there’s one exception to the rule: the search for Earth 2.0. Here we don’t want to find the unexpected, but the expected. We want to find a planet so similar to our own, we can almost call it home. While, we can’t exactly image these planets with great enough detail to see if one’s a water world with luscious green plants and civilizations, we can use indirect methods to find an “Earth-like” planet — a planet with a similar mass and radius to the Earth. There’s only one problem: the current techniques to measure an exoplanet’s mass are limited. To date astronomers measure radial velocity — tiny wobbles in a star’s orbit as it’s tugged by the gravitational pull of its exoplanet — to derive the planet-to-star mass ratio. But given that most exoplanets are detected via their transit signal — dips in light as a planet passes in front of its host star — wouldn’t it be great if we could measure its mass based on this method alone? Well, astronomers at MIT have found a way. Graduate student Julien de Wit and MacArthur Fellow Sara Seager have developed a new technique for determining mass by using an exoplanet’s transit signal alone. When a planet transits, the star’s light passes through a thin layer of the planet’s atmosphere, which absorbs certain wavelengths of the star’s light. Once the starlight reaches Earth it will be imprinted with the chemical fingerprints of the atmosphere’s composition. 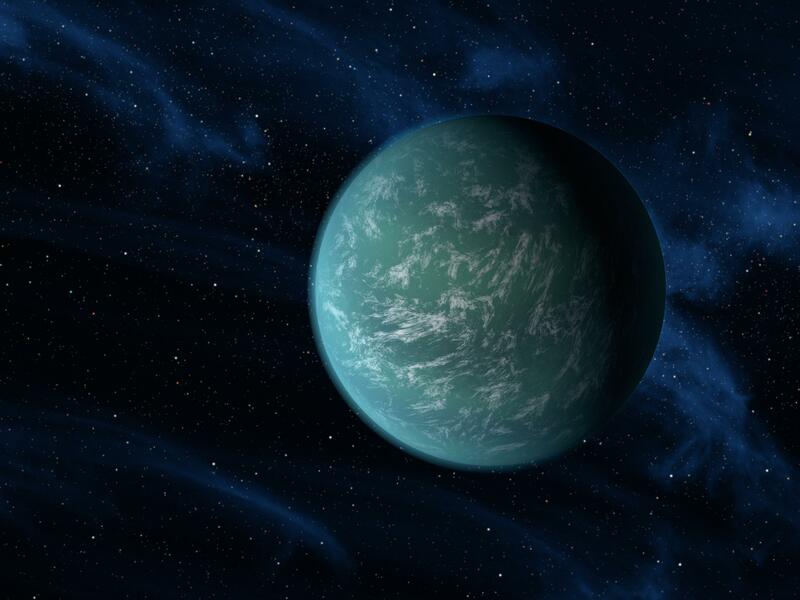 The so-called transmission spectrum allows astronomers to study the atmospheres of these alien worlds. But here’s the key: a more massive planet can hold on to a thicker atmosphere. So in theory, a planet’s mass could be measured based on the atmosphere, or the transmission spectrum alone. Of course there isn’t a one to one correlation or we would have figured this out long ago. The atmosphere’s extent also depends on its temperature and the weight of its molecules. Hydrogen is so light it slips away from an atmosphere more easily than, say, oxygen. So de Wit worked from a standard equation describing scale height — the vertical distance over which the pressure of an atmosphere decreases. The extent to which pressure drops off depends on the planet’s temperature, the planet’s gravitational force (a.k.a. mass) and the atmosphere’s density. According to basic algebra: knowing any three of these parameters will let us solve for the fourth. Therefore the planet’s gravitational force, or mass, can be derived from its atmospheric temperature, pressure profile and density — parameters that may be obtained in a transmission spectrum alone. With the theoretical work behind them, de Wit and Seager used the hot Jupiter HD 189733b, with an already well-established mass, as a case study. Their calculations revealed the same mass measurement (1.15 times the mass of Jupiter) as that obtained by radial velocity measurements. This new technique will be able to characterize the mass of exoplanets based on their transit data alone. While hot Jupiters remain the main target for the new technique, de Wit and Seager aim to describe Earth-like planets in the near future. With the launch of the James Webb Space Telescope scheduled for 2018, astronomers should be able to obtain the mass of much smaller worlds. The paper has been published in Science Magazine and is now available for download in a much longer form here. If an Earth sized exo-planet were geologically dead and had no magnetosphere, wouldn’t the host star’s solar wind strip away the exo-planet’s atmosphere over time? With less detectable atmosphere, wouldn’t the exo-planets mass computed by this new Transmission Spectroscopy technique underestimate the actual mass? I think you’re right. The paper itself says that this technique is only applicable to hot Jupiters at the moment, because the atmospheric composition is known (bog-standard H/He mix) and because the vertical structure of the atmosphere will depend only on the mass and temperature of the planet. This simplifies the calculations considerably. Like you, I think the prospect of measuring masses of planets with hard surfaces will be trickier. Now the mass of the atmosphere does not directly depend on the mass of the planet (consider the case of Earth and Venus; same planet mass but hugely different atmospheres). But the way the density of the atmosphere drops off with height still will depend on the planet’s mass, and so we should still be able to extract some information. That said, it’s easier to guess the mass of a rocky planet directly from its radius than to guess the mass of a gas planet. Add rock to a rocky planet, and its radius increases. Add gas to a Jupiter type planet, and it stays the same size, ust becoming denser.